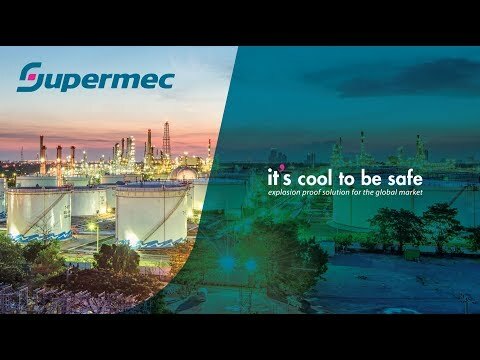 From the inventor of self-regulating technology and with installed base output exceeding 500,000 km, Supermec introduces a self-regulating systems granting a proven and most reliable solution. The most forgiving of all existing heat-tracing technologies, self-regulating heating cables incorporate a heating element made of polymers mixed with conductive carbon black. This special blend of materials extruded between the conductors creates electrical resistive paths. The number of electrical paths changes in response to temperature fluctuations. As the temperature surrounding the cable decreases, the conductive core contracts on a microscopical level, decreasing the electrical resistance and creating numerous electrical paths between the conductors. Current flows along these paths to warm the core. As the temperature rises, the core expands on a microscopical level, increasing electrical resistance and decreasing the number of electrical paths. As a result, the heating cable can be overlapped several times without risk of degradation, since the power is greatly reduced at high temperatures. Self-regulating heating cables may be cut-to-length on-site and can be overlapped multiple times at valves, flanges and instruments without the risk of local overheating. Because the heater senses and responds to actual conditions along the pipe, the system accommodates variations due to static fluid and differing elevations. Our self-regulating heating cables offer unconditional T-ratings as specified by European norm EN 60079-30-1 (no requirement for sheath temperature calculations/controls). When designed properly, the process medium won’t exceed a certain temperature even when temperature controls fail. The BTV range of self-regulating heating cables is mainly used for frost protection of pipes and vessels but can also be used to maintain processes up to 65°C. These heating cables are available in two different outer jacket materials. The polyolefin outer jackets (-CR) are suitable for use in areas where the cables will only be exposed to mild inorganic solutions whereas the fluoropolymer outer jackets (-CT) offer a high general chemical resistance. The QTVR range of self-regulating heating cables is mainly used for frost protection of pipes and vessels requiring a higher power output than the BTV heating cables can supply. They can also be used to maintain processes up to 110°C. These heating cables all have fluoropolymer outer jackets offering a high chemical resistance. The XTV range of self-regulating heating cables is used for frost protection of pipes and vessels that require steam cleaning. They can also be used to maintain processes up to 120°C. These heating cables all have fluoropolymer outer jackets offering a high chemical resistance. The KTV range of self-regulating heating cables is mainly used for frost protection of pipes and vessels that require steam cleaning. They can also be used to maintain processes up to 150°C. These heating cables all have fluoropolymer outer jackets offering a high chemical resistance. The VPL range of power-limiting heating cables is mainly used for temperature maintenance of processes and offers the advantage of a high power output at high temperatures which can reduce the number of heating cables required. They can also be used for frost protection of pipes and vessels that require steam cleaning. These heating cables all have fluoropolymer outer jackets offering a high chemical resistance. The VPL products are available in various voltages, 110 Vac, 230 Vac and 480 Vac. The 480 V version offers the further advantage of long circuit lengths potentially reducing the number of supply points required.